SPENSA — an acronym for Special Needs Soccer Association — has provided a life-changing service to special needs children for decades, and their goal for the future is “to continue to provide an opportunity for young people with special needs while ensuring we are teaching our volunteers how to serve others,” according to Janet Oberle, the organization’s president. “Our vision is to engage the local community to participate as volunteers with SPENSA in order to help teach young people how to serve others, how to recognize the gift of being able bodied and able minded, how to value each person in this world and break down barriers that may exist between kids with special needs and kids without special needs,” Oberle said in an email. This is the mission of the fully volunteer-run St. Louis-based organization under the U.S. Youth Soccer TOPSoccer program, which is focused on giving children with special needs the chance to play soccer for free. Oberle got involved with SPENSA in 1989 and has been on the board since 2005. Since her start, the organization has grown significantly. Both sessions are 6-8 weeks long and include a one-hour training session every Saturday morning. With more interest in the program growing, more participants and volunteers have become involved. Along with the weekly practices, SPENSA participants occasionally get the opportunity to train with professional teams and even play at halftime of big local games. Being entirely run by volunteers, SPENSA is always looking for people to get involved and buddy up with a player during the weekly training sessions. They also partner with local colleges and high schools, including Missouri Baptist University, Saint Louis University and Ladue High School, as well as club soccer programs, area youth groups, confirmation groups, Enterprise Rent-A-Car and more. “We have also been fortunate that we have some key organizations or individuals who have done some fundraising for the organization, which we are so grateful for, as we are committed to the program being free for our families,” said Oberle. Fundraised money allows SPENSA to provide shirts, backpacks, winter hats and hoodies with the organization’s logo on it so that players can proudly show off the team they play for. Ben Boyd, an MBU senior last year who majored in physical education, and Justin Schuttenberg, also a senior last semester who majored in behavioral science, were both players on the Spartan men’s soccer team and have volunteered at SPENSA multiple times with the team. 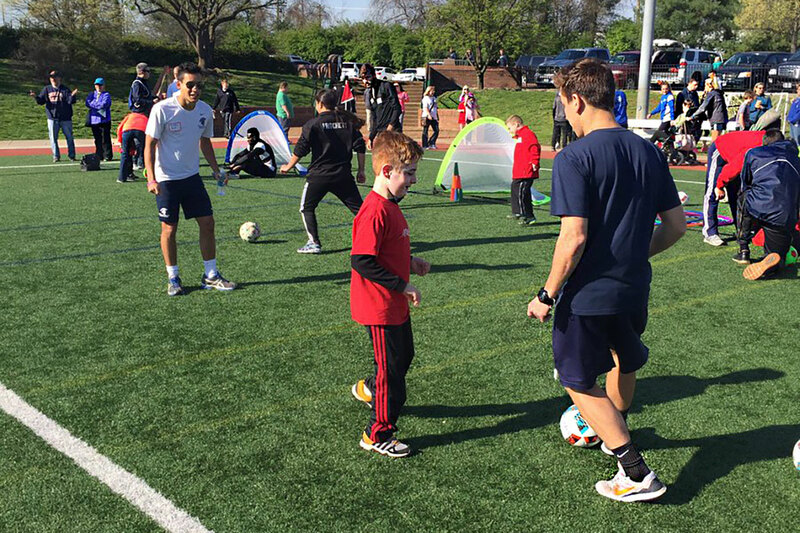 The men’s soccer program volunteers once a year with each player pairing up with a child on a Saturday training session to kick a ball around with them, encourage them to get involved and simply spend some quality time enjoying the sport with them. The spring session begins in April each spring, and the Spartan soccer team always participates. SPENSA holds its weekly training sessions at World Wide Technology Soccer Park, home of the city’s professional team, STL FC. Volunteering for SPENSA is an opportunity to get involved with a meaningful organization in the local community, and they are always looking for more people to join. More information is available on SPENSA’s website, and for those interested in volunteering, contact Shirley McBroom, the organization’s volunteer coordinator and secretary, on the website.